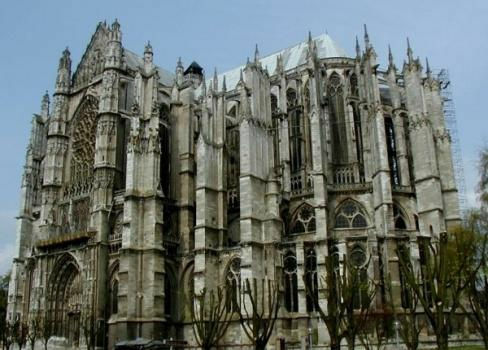 Work started on Beauvais Cathedral, Cathédrale Saint-Pierre de Beauvais, in 1225 and the choir was complete in 1272. At the time it was the highest vaulted building in Europe. Work continued but was interrupted in 1284 by the collapse of some of the vaulting of the recently completed choir. It is believed that the collapse was caused by resonant vibrations caused by high winds. This collapse is often seen as a disaster that produced a failure of nerve among the French stone masons. After a few centuries delay, work recommenced and the transept was completed in 1548. In 1573, the collapse of the over-ambitious 153-m (502 feet) central tower stopped work again. The tower would have made the church the tallest structure in the world at the time. Afterwards little structural addition was made. 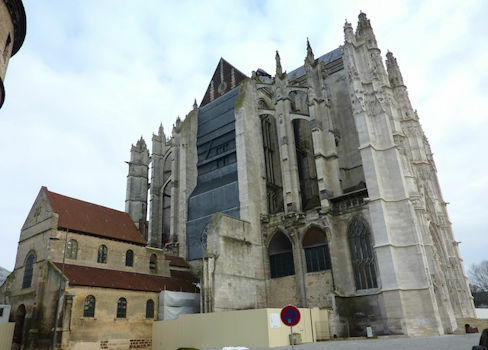 The Basse Œuvre ("low work") is a vestige of a 10th-century Romanesque church, the predecessor of the cathedral. It was intended to have been demolished to make room for the cathedral's nave – but the nave was never built, and the Basse Œuvre remains. Thanks to Adan Regec for guiding me to this magnificent building.